To his Excellency George Clinton, Esq, Governor of the State of New-York, General and Commander in Chief of all the Militia, and Admiral of the Navy of the same. The respectful ADDRESS of the Assembly of the State of New-York, in answer to his Excellency's Speech, at the opening of the Session. 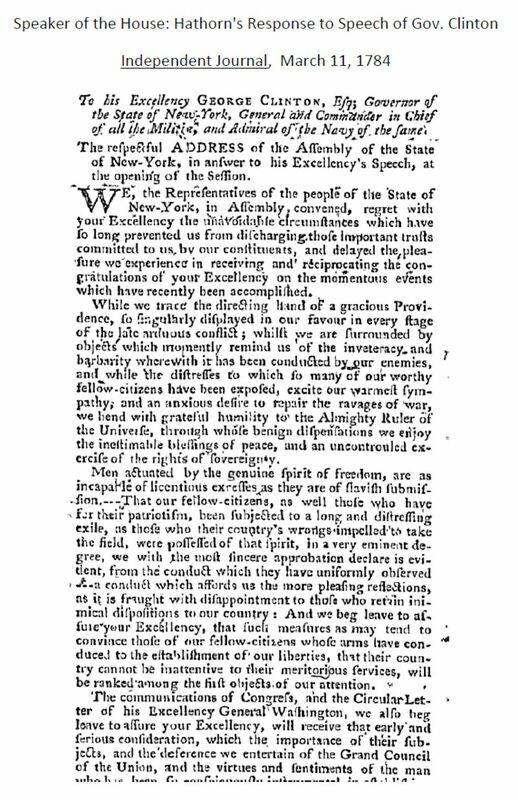 We, the Representatives of the people of the State of New-York, in Assembly convened, regret with your Excellency the unavoidable circumstances which have so long prevented us from discharging those important trusts committed to us, by our constituents, and delayed the pleasure we experience in receiving and reciprocating the congratulations of your Excellency on the momentous events which have recently been accomplished. While we trace the directing hand of a gracious Providence, so singularly displayed in our favor in every stage of the late arduous conflict; whilst we are surrounded by objects which momently remind us of the inveteracy, and barbarity wherewith is has been conducted by our enemies, and while the distresses to which so many of our worthy fellow-citizens have been exposed, excite our warmest sympathy, and an anxious desire to repair the ravages of war, we bend with grateful humility to the Almighty Ruler of the Universe, through whose benign dispensations we enjoy the inestimable blessings of peace, and an uncontrouled exercise of the rights of sovereignty. Men actuated by the genuine spirit of freedom, are as incapable of licentious excesses as they are of slavish submission---That our fellow-citizens, as well those who have for their patriotism, been subjected to a long and distressing exile, as those who their country's wrongs impelled to take the field, were possessed of that spirit, in a very eminent degree, we with the most sincere approbation declare is evident, whom the conduct which they have uniformly observed--- a conduct which affords us the more pleasing reflections, as it is fraught with disappointment to those who retain inimical dispositions to our country: And we beg leave to assure your Excellency, that such measures as may tend to convince hose of our fellow-ciizens whose arms have conduced to the establishment of our liberties, that their country cannot be inattentive to their meritorious services, will be ranked among the first objects of our attention. The communications of Congress, and the Circular Letter of his Excellency General Washington, we also beg leave to assure your Excellency, will receive that early and serious consideration, which the importance of their subjects, and the deference we entertain of the Grand Council of the Union, and the virtues and sentiments of the man who has been so conspicuously instrumental in establishing our independence, cannot fair to command. The designs of Britain, to affect a monopoly, or to enable its avowed undisguised subjects amongst us, to engross a large portion of our West-India trade,, we confidently hope, will, by the unanimity and firmness of the Councils of the confederated States, be effectually defeated. And we are happy to observe, that a measure which had for its object, the monopolizing a particular branch of trade, will have a tendency more generally to divert it inco channels, promotive of the interests of those Powers who have aided the United States in the late was, but more especially the nation whose illustrious Monarch has, by a series of generous exertions, so essentially contributed to the attainment of that happiness we now enjoy. Your Excellency may be assured, that our aid will most chearfully afforded, to deprive the British nation of those advantages she expected to derive from restraints on our commerce. Impressed with the necessity of establishing commercial regulations, extending credit, making provision for funding the principal, and the payment of the interest of public debts, establishing, reviving and encouraging seminaries of learning, improving our revenues; promoting the speedy settlement of the uncultivated territory of the State, revising the laws, procuring magazines and military stores, garrisoning the Western posts, and providing a liberal support for the Officers of Government, we shall sedulously apply ourselves to advance those important measures, convinced that they are intimately blended with the most essential interests of the State. The election of Delegates to represent this State in Congress of the United States of America has already been a subject of our consideration, and will, we hope, be perfected at an early day.--That of Members to compose a Council of Appointment, in compliance with your Excellency's recommendation, has also been attended to. It is with the most painful emotions we observe that the settlement of accounts between the United States and the inhabitants of this State has been so long and so unnecessarily protracted-- A circumstance which is the more distressing as the citizens of this State, have peculiarly experienced the calamities of the late war, and from their distinguished exertions in the common cause, had at least an equal claim to relief with that extended to the other confederated States. We shall be happy by our attention to the important concerns, which must necessarily become subjects of our deliberation in the present session, to evince, that the promotion of the public weal is our primary object. Permit us to assure your Excellency of the high sense we entertain of that unremitted application to the duties of your station, which has invariably marked your conduct through the whole of your administration in the government of this State, and that we cannot harbour a doubt, but that you will continue to exert yourself for the advancement of the happiness of a people, in the defense of whose rights, your Excellency has been distinguished among their first patriots in the field, and who have by their suffrages, given you the most honourable testimonial of their approbation and confidence, by repeatedly re-electing your Excellency to the Chief Magistracy of the State. To His Excellency, GEORGE CLINTON, Esq., Governor of the State of New-York, General and commander in Chief of all the Militia, and Admiral of the Navy of the Same. The respectful ADDRESS of the ASSEMBLY of the said state, in answer to His Excellency's Speech at the opening of the Session. We, the Representatives of the Assembly, beg leave to assure your Excellency, we are fully convinced that a due regard to the interesting affairs of the state, has been your only inducement to convene the Legislature at this yearly season; and we shall proceed in the more pressing business committed to our charge, with cheerfulness and dispatch. The claim of Massachusetts to lands supposed to be somewhere within the ancient jurisdiction of this state, being of so important and unexpected a nature, will command our most serious and immediate attention. The election of Delegates to Congress, and members to compose a Council of Appointment, have already been subjects of our deliberation. The acts of Congress, respecting the arrears of interest of the national debt, and the expences for the year 1784, and a requisition of money to discharge the same, as they involve not only the faith and credit of this state, but also of the whole union, will be subjects of our attention. We approve the reasons assigned by your Excellency, for not convening the Legislature on your receipt of the act of Congress, recommending it to this and some other of the states, to raise a proportion of their militia for taking possession of the western ports, guarding the public stores, and protecting the treaties with the Indians. We however regret, that those ports have not yet been delivered up by the British commander in Canada, as the withholding them evidently tends to the injury of this state. We are well convinced, that, the right to large tracts of unimproved lands within the state, being vested in absentees and aliens is detrimental to its settlement, population and prosperity; because, under such circumstances, the lands remain uncultivated and unprofitable, and are increasing in their value for the benefit of strangers, by the labour and expence of our industrious citizens: We shall therefore consider it our duty to adopt measures productive of their speedy improvement. It is evidently, necessary to ascertain the value of taxable property within the state, not only that harmony may be preserved among our citizens, but also that we may be enabled to establish a mode of taxation which may in future be more equal and efficacious in its operation. From the fullest conviction we concur with your Excellency, that hitherto no adequate system has been adopted for drawing the revenues, expenditures or debts of the state to a point, nor any effectual means pursued for ascertaining either is resources or expenses. This matter is so essential to the preservation and respectability of government, that it shall be ranked among the objects of our serious discussion. The revising and digesting the laws of the late colony and of this state, and such of the British statues as are adopted by the constitution, the general regulation of highways and the internal economy of districts and precincts, appear to us so necessary and useful, that we have already taken them under consideration; as also the defects in the acts for establishing an university in this state, and the import act. The various and important matters which your Excellency has been pleased to recommend to us, shall in their order be duly attended to; and you may be assured, that we meet with the most cordial disposition to pursue every measure tending to advance the interest and honour of the state, or the convenience and advantage of our constituents. From the Orange County Address -- adopted in a meeting of One Thousand Yeomanry. 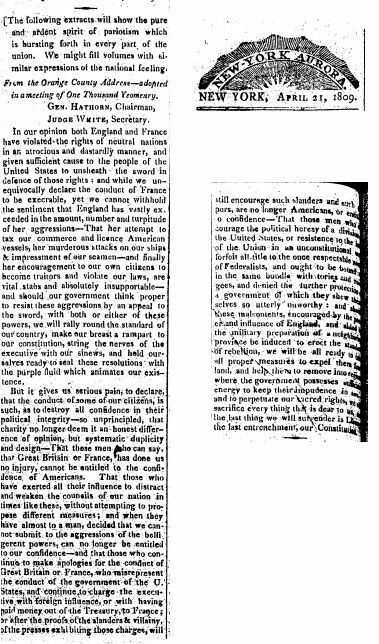 In our opinion both England and France have violated the rights of neural nations in an atrocious and dastardly manner, and given sufficient cause to the people of the United States to unsheath the sword in defense of those rights; and while we unequivocally declare the conduct of France to be execrable, yet we cannot withhold the sentiment that England has vastly exceeded in the amount, number and turpitude of her aggressions--That her attempt to tax our commerce and licence American vessels, her murderous attacks on our ships and impressment of our seamen--and finally her encouragement to our own citizens to become traitors and violate our laws, are vital stabs and absolutely insupportable--and should our government think proper to resist these aggressions by an appeal to the sword, with both or either of these powers, we will rally round the standard of our country, make our breast a rampart to our constitution, string the nerves of the executive with our sinews, and hold ourselves ready to seal these resolutions with the purple fluid which animates our existence. But it gives us serious pain, to declare, that the conduct of some of our citizens, is such, as to destroy all confidence in their political integrity--so unprincipled, that charity no longer deem it an honest difference of opinion, but systematic duplicity and design--That these men who can say, that Great Britain or France, has done us no injury, cannot be entitled to the confidence of Americans. That those who have exerted all their influence to distract and weaken the councils of our nation in times like these, without attempting o propose different measures; and when they have almost to a man, decided that we cannot submit to the aggressions of the belligerent powers, can no longer be entitled to our confidence--and that those who continue to make apologies for the conduct of Great Britain or France, who misrepresent the conduct of the government of the U. States, and continue to charge the executive with foreign influence, or with having paid money out of the Treasury, to France; or after the proofs of slanders & villainy of the presses exhibiting those charges, will still encourage such slanders and such ?illegible word? , are no longer Americans, or entitled to confidence--That those men who encourage the political heresy of a dividing of the Union in an unconstitutional way will forfeit all title to the once respectable name of Federalists, and out to be bound in the same bundle with tories and ?illegible word?, and denied the further protection of a government of which they shew themselves so utterly unworthy: and should these malcontents, encouraged by the pressure and influence of England, and sided with the military preparation of a neighboring province be induced to erect the standard of rebellion, we will be all ready to take all proper measures to expel them from the land, and help them to remove into regions where the government possesses sufficient energy to keep their impudence in ?check? and to perpetuate our sacred rights, we will sacrifice everything that is dear to us, and the last thing we will surrender is Liberty, the last entrenchment, our Constitution. Note: the spelling and punctuation is an exact transcript of the newspaper article.GGH.